Leaderflush Shapland can now offer specifiers, contractors and installers alike a highly effective intumescent seal option: EcoGuard (UK Patent Application No. 1302299.1) that not only provides up 60 minutes fire resistance, but presents an extremely clean and simple installation. The newly developed wedge shaped seal is designed for application between the gaps of a door frame and surrounding wall during installation, for a more precise and dry fit. The wedge shape accommodates varying gap widths around the perimeter, whilst its compressible nature ensures an appropriate friction fit. EcoGuard offers contractors and installers, accurate and even coverage around the perimeter of the frame all in one clean and simple on-site application – without the requirement for tubes of intumescent mastic, which can be difficult and messy to work with. EcoGuard has already been used successfully on the Scottish Southern General Hospital, where Leaderflush Shapland is supplying approximately 7600 doorsets. Like all Leaderflush Shapland products, specifiers can be fully confident in the performance of EcoGuard. The product is fully backed up by rigorous testing in accordance with British Standards BS 476 part 22. Stephen Hutsby, New Product Development Manager at Leaderflush Shapland explains further: “Fire doors are highly effective in retaining fire for a specified period of time, but the areas around the perimeter of the frame must also be considered during installation. Fire will penetrate any gap and therefore it is crucial that the perimeter of the frame is effectively sealed. 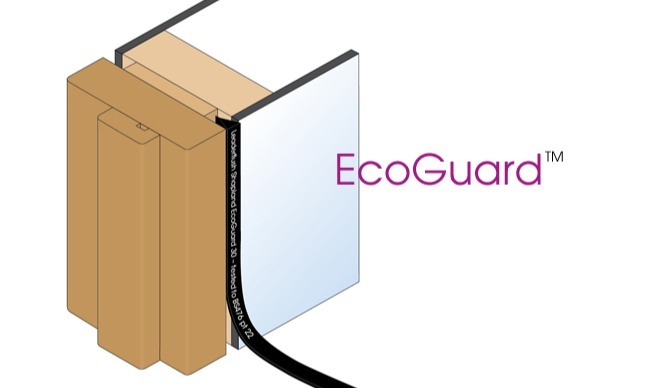 We have ensured that the EcoGuard seal provides an effective and even coverage around the perimeter of the frame, simplifying the fire stopping process and therefore eliminating the need to consult the often confusing guidelines in tables two and three of British Standards BS 8214.